Today, we’re taking about the Swanson Speed Square . A speed square is an essential DIY tool for woodworking. Invented way back in 1930, the popularity of the Swanson speed square has grown substantially over time. The speed square is a rafter square, miter square, try square, scribing guide, protractor and, perhaps most usefully, a good saw guide. As a Saw Guide: You simply hold the speed square base against the lumber and align the guide rail on your circular saw (being sure to keep your hands clear of the blade) to make clean straight cross-cuts. As a Protractor: Simply hold the base against a flat surface and find the desired angle marking. To Find Rafter Angles: The primary use is to find the angle for rafters. Calculating the correct angles for a rise to run ratio is simple with trigonometry, but the speed square eliminates the need for a calculator. First, set the pivot at the edge of the board. Next, rotate the square around that point until the edge of the board aligns with the mark you want on the common scale. Mark a line along the ruled side of the square. The speed square also makes quick work of hips and valley rafters– same method as for common rafters, but use the Hip-Val” scale. To scribe parallel lines: An often overlooked feature is the scribe feature. The tool provides a set of notches 1/4 inch apart. Set a pencil in the desired notch and slide the square along the board to mark a parallel line. Be sure to pick one up before your next DIY woodworking project. 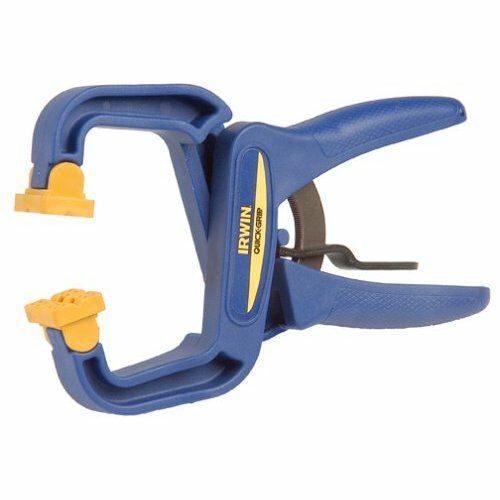 Today, we’re looking at a tool I recently got to help make cuts on the projector project, the Irwin Quick-Grip 59400CD 4-Inch Handi-Clamp. The Pros: Simple to use; if you can squeeze, you already know how to use it. Padded gripping surface. The Cons: Mid-price at under 10 dollars. not the cheapest clamp, but probably one of the most useful and versitile clamps. Grip seems slightly weak. 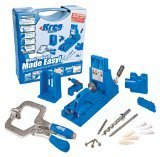 The Review: Overall 3.8/5.0 – I used this clamp to hold light firring strips to a table to make cuts with my circular saw and it was more than enough when combined with a light grip on the board with my free hand. While the clamp initially seemed to have a weak grasp, it’s ease of use and operation makes up for it. Also, in practice the Irwin Quick-Grip Handi-Clamp proved to be a sturdy tool, perhaps only limited by my own grasping strength. With padded gripping surfaces and easy release mechanism, you’ll find plenty of uses for this clamp–and you won’t need to worry about marring finish surfaces. It is an excellent clamp for the price. It really is a “handy clamp” and makes an excellent addition to the DIY toolbox. Anyone else use this clamp? Like it? Hate? Is there another you’d recommend? As you may know, there are many styles of stud finders out there, and most people prefer the simple, electronic Zircon-style that use battery power to measure the depth. But if you looked in your parent’s (or grandparent’s) toolbox, you might find a very different stud finder. One that used a rare earth magnet to detect the screws or nails attaching the drywall to studs. Well, if you find yourself with out a proper stud finder, you can fashion own DIY Stud Finder from a simple rare earth magnet and any sort of handle you have on hand. Simply glue the magnet to your handle and drag lightly across the wall until you feel the pull. Simple and effective.